Thanks to two effusive research reports, Apple Inc. (Nasdaq: AAPL) stock cracked the $100-a-share milestone yesterday (Tuesday). The close of $100.53 also marked an all-time closing high for Apple stock. The previous all-time closing high (before the 7-to-1 stock split in June) was $702.10, or $100.30 adjusted. In early trading this morning (Wednesday) AAPL hit $100.77, edging past its previous all-time intraday high of $705.07 pre-split, or $100.72 adjusted. As of yesterday's close, AAPL stock is now up 25.43% year to date, compared to just 7.2% for the Standard & Poor's 500 index. The price rise also has made Apple by far the largest company in the world by market cap. The Cupertino, Calif.-based tech giant's $601 billion valuation is way ahead of the next largest company, ExxonMobil Corp. (NYSE: XOM) at $423 billion. Given all the excitement about fall product launches, including the iPhone 6 and the long-rumored iWatch, it was only a matter of time before Apple shares crossed the $100 mark. But yesterday's Morgan Stanley (NYSE: MS) report by analyst Katy Huberty and another by RBC Capital Markets analyst Amit Daryanani forced the issue. "We recommend adding to positions into the iPhone 6 + iWatch product cycles," Huberty said. Huberty listed a broad range of catalysts for the Apple stock price, and raised her price target from $99 to $110 with an "overweight" rating. Daryanani mostly saw higher-than-expected iPhone 6 sales as driving Apple stock, in addition to new iPads and the potential for "other major product lines." Let's look at these catalysts in more detail. First and foremost, there's the iPhone 6, which is expected to debut at a special event Sept. 9. Supply chain data has forced Daryanani to reconsider his iPhone 6 estimate of 65 million units sold. "Most supply chain data is pointing towards Apple gearing up to ramp 70-80 million iPhone 6 units across the two form factors (4.7"/5.5")," Daryanani, who also raised his price target for AAPL to $110, said. "This is a notable uptick from last year when the supply chain ramped 50-60 million units." 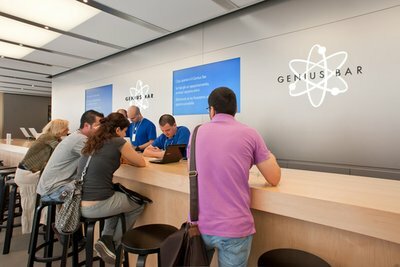 Meanwhile, Huberty noted that that iPhone loyalty has increased from 73% in December 2011 to 90% in March. The iPhone accounts for more than half of Apple's profits.